In the well known words of Johnny Mac the SuperBrat, who wasn’t quite talking about the modern fashion media but certainly could have been: You cannot be serious. Forget that Rockport was nearly wiped off the map. Forget that Houston is under water. Forget about thousands upon thousands who find themselves homeless in the aftermath of Harvey’s Texas landfall. Forget about the rescue missions still underway and forget, if you can, about Houston PD Sgt. Steve Perez who drowned on duty in the flooding and about the toddler found clinging to the body of her drowned mother. Forget all that; Lynn Yaeger is appalled by. . .insensible shoes. Okay, fashion is Yaeger’s business. And she writes about it; that’s what she does. Fair enough. Her eye was naturally drawn to Melania’s snakeskin stilettos–the very sort of fancy footwear featured on the glossy pages of Yaeger’s own American Vogue. I get that. Fashion has been Yaeger’s business for a long time–and these days, business is good when you’re bashing the First Lady so many on the left love to hate. Yaeger herself has long been known for her extremely eccentric, individual wild style. Hey, more power to her! I was unquestionably the Andie Walsh of my high school. Add to that I’m teetering on libertarianism, and you know I’m the first to say, “Do your own thing!” By that token, I can give latitude to the look that had someone peeking at Yaeger’s picture over my shoulder sincerely asking if she’s in the remake of “It.” The fact she doesn’t allot the same grace to Melania’s personal brand is the part that raises my eyebrows. And on the subject of irony, Yaeger takes the fight further by way of a swing at the First Lady’s anti-bullying crusade, proclaiming her husband, our president, “unquestioningly the greatest cyber bully” since Al Gore invented the Internet. This, you know, while kind of bullying Melania over her dauntingly daring style choices. She even pokes fun at the image she creates in her own mind of the practical gear the First Lady may have had stashed aboard Air Force One, making a snarky remark about a possible pair of “leopard print Wellies-in-waiting.” Ah, there’s that sharp wit the ol’ girl’s credited with. I’m guessing Yaeger wouldn’t think much of the 50 shades of pink, rose-print rain boots I was famous for in my time at Heritage Ranch. And I could live with that, with her disdain from on high. 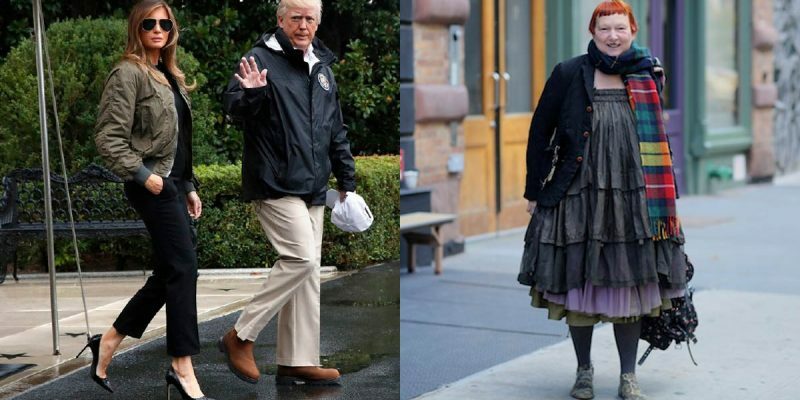 Because while half of those paying attention to the shameful shoe debacle are referring to the alleged offense as “Melania Trump’s Stiletto Controversy” and the other side is saying it’s all an excuse for the “Media’s Faux Outrage,” I have to think that for the as-yet-innumerable host of victims in the path being hammered by Hurricane Harvey–it’s an absolute non-issue. “What kind of message does a fly-in visit from from a First Lady in sky-high stilettos send to those suffering the enormous hardship, the devastation, of this natural disaster?” Yaeger ponders. Frankly, my dear Yaeger, I can’t imagine they give a damn. Previous Article What Is The FBI Trying to Hide About Hillary Clinton? Next Article VIDEO: Does This Look Like An Accident, Or An Assassination Attempt, To You?